Come and experience scuba diving on one or more of the Sunshine Coast's beautiful local reefs. Be amazed by the beautiful coral and magnificent marine life, suitable for the beginner to the most experienced divers. Leaving from Mooloolaba, we explore reefs from Noosa to Caloundra. Diving on the Sunshine Coast is simple and easy. Not only do the coral reefs rival the marine diversity of the Great Barrier Reef, you’ll only need to spend 20 minutes on a boat getting out to the action. This is why the Sunshine Coast attracts local, state, interstate and international divers. Combine the sheer diversity of life, richness of the waters, vivid colours and lack of coral bleaching and the Sunshine Coast is a veritable diving haven. The bountiful sea life of Mudjimba Island has contributed hugely in making it a popular location for diving all year round with a depth between 10m (32.8 ft) and 15m (49.2 ft). During summer, its temperature is around 28°C (82.4°F) while in winter it records an average temperature of about 20°C (68°F). Mudjimba Island or as locals call her, Old Woman Island, serves as a home to many sea sponges, hard and soft corals and nudibranch species. People who go diving are able to observe the coral gardens of Old Woman Island which starts at a 2m (6.56 ft) and also experience the sight of turtles, stingrays, crayfish, wobbgong sharks, sea whips, starfish, small groper, gorgonians and coral trout. Old Woman Island provides a good atmosphere for first time visitors. "This was only my 3rd open water dive and they made me feel completely comfortable and at ease. The marine life sightings were unreal! Three turtles, a shark, nudibranchs, and much more. Thanks a million, guys!" Jew Shoal is located in Noosa’s pristine Laguna Bay and is reachable by boat in just 20 minutes. The site itself is a large complex of canyons, ridges and bommies, with two main features. Expect to see reef fish including angelfish, butterflyfish, surgeonfish, globefish, rabbitfish, soapfish, morwong, sweetlip and bream – as you meander through the caves. The caves consist of several large swim throughs which are a buzz with marine life. Its gutters are covered in colourful hard and soft corals. And secondly, the pin starts at seven metres depth dropping down to 16m as you descend. There are plenty of ledges, walls, and crevices to explore. Seasonal mantas and grey nurse sharks even turn up from time to time. The coral gardens here are home to an array of marine invertebrates - sea stars, feather stars, hermit crabs, urchins, cowries and over 100 varieties of nudibranchs. Both main sites feature fantastic coral layouts to go and explore for divers of all skill levels. The colourful coral gardens of Mudjimba (Old Woman) Island are reached in less than 20 minutes by boat from Mooloolaba. This popular shallow water dive site has a dazzling array of marine life including lots of soft corals, sea sponges, sea anemones and a variety of tropical fish. It’s a safe, easy dive that is great for beginners in its sheltered shallow waters. This site is also great for snorkelling. ​Just offshore from Mooloolaba in the warm coastal waters of the Coral Sea lies the Inner Gneerings reef system. This comprehensive coral network includes numerous diverse and amazing dive spots, including Hanging Rock, the Pinnacles, Wobby Rock, the aptly named Fairyland and many, many more. The reef of the Inner Gneerings is adorned with many beautifully coloured soft corals, black coral trees and white coral whips. The area is a divers dream with a variety of marine life including rays, loggerhead and green turtles, moray eels, wobbegongs and leopard sharks – not to mention dramatic crops and coral shelves. Watch out for the sapphire damsels and fairy basslets darting in and out of cover. This site is suitable for beginners, open water and advanced divers. Sunshine Coast, Queensland is home to the Outer Gneering Shoals diving site. This site is, on average around 18 metres deep but does drop down to 25 at its maximum. Visibility is usually a good, clear 15 metres which makes the site feel quite open as you are able to see a lot further than in many other diving areas. Outer Gneering Shoals is an open water site that takes approximately 30 minutes by boat to get to. 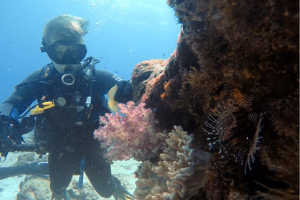 Magic Mountain, a dive site on the Outer Gneerings Reef off Mooloolaba's coast, is a dive for more experienced divers due to its depth and the complex structures formed by rocky outcrops. The large group of outcrops extend from the sandy ocean floor to form numerous gullies, ravines, bommies, swim-throughs and pinnacles, all housing soft and hard coral colonies. Fish calling Magic Mountain home include morwong, wrasse, leatherjackets, batfish, bullseyes, butterfly and angelfish. Numerous urchins, nudibranchs, anemones, feather and brittle stars, crabs, crayfish, wobbegongs and the occasional groper are also found on this rugged structure.